Since a internal combustion engine consists of moving parts, lubrication of mating parts is of at most importance. The friction not only protects the parts from frictional wear but also from high temperature of burning fuel by carrying away heat. Act as coolant for cooling parts. Piston ring and wall of cylinder is sealed with lubricant film. The flow of oil or lubricant washes away any dirt, contaminants from rings of piston and other parts. Smoothness in operation and reduction in noise of mechanical moving parts. Should not be highly viscous or extremely fluid. It should maintain constant viscosity. Heat absorbing capability should be high. In this type of lubricating system, at the bottom of engine there is a lubricating sump which holds oil in it. 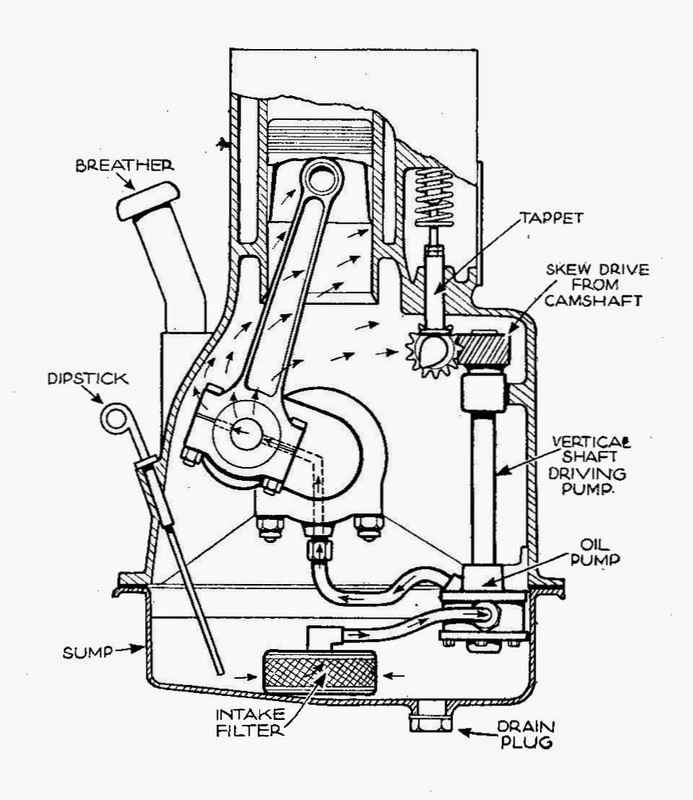 The pump or in some cases connecting rod splashes the oil to all parts of engine. All parts with schematic sketch are depicted in the figure. The flow of lubricant can be studied precisely. Used in two-stroke engine (vehicles like scooters).The lubricant is mixed with fuel itself. This results in heavy smoke from exhaust. Advantage is that it is low in cost. It becomes very necessary to cool the engine inner atmosphere of enormous heat which is due to combustion of fuel and air mixture under high pressure. The process of combustion evolves high heat of around 2500 degree to 2700 degree which can produce high thermal stress causing cracking of engine and can reduce overall efficiency of internal combustion engine. To protect the lubricant film between the mating or moving parts from burning at high temperature. Protecting parts from being overheated. To avoid thermal stresses as this may cause cracking of parts of engine. The heat to the environment is expelled through fins. The fins are provided on the surface of cylinder wall. As the heat flows through the fin, it is conducted to the air which flows over the fin surface. There is certain advantage of this type of cooling system. 1.There is no need of radiator and other electronic device like pump. This type of cooling is far more efficient then air cooling system. The system performs cooling by providing water jacket throughout the engine component. The water jacket is provided with cool water which enters into engine outer case and absorbs heat from there. The heated water is circulated outward and is cooled by radiator and fresh air (cool) passing over the jacket. This process is repeated. In thermo-syphon water cooling system, there is temperature difference which initiates water circulation. In pump circulation system there is requirement of pump which gets power from engine by V-belt arrangement.